12 hours after Don Santee uttered those words at a hotel bar, I was underwater. Thanks to a dare from the Cousteau family dive master, I was going to the depths in the name of a quote. I’d never dived before. In fact, I usually avoid going underwater at all, but Santee’s dare had me geared up in full SCUBA garb gliding through a coral reef. As thousands of fish fluttered by in every color of the rainbow, one consistent thought came to mind—this is Discovery Channel come to life. Santee said it would be like this. That I’d love it or hate it underwater. And I’ll admit, the first few minutes of SCUBA were pure panic. An early morning crash course in a beachside pool started with a sputter; a coughing, chocking cacophony accompanied my first breathes below. I’d never been so sure I couldn’t do something in my life—if I could barely breathe in a wading pool, there’s no way I could jump off of a boat towards the bottom of the South Pacific. Breathing underwater is not natural. Your brain immediately tells you not to do it, instinctively knowing you’ll drown. Holding your breathe, too, is a cardinal sin of SCUBA, so you can’t do that either. No. To do this right, you have to recalibrate your body’s awareness and slow yourself down. You have to breathe, and you have to move slowly. Not wanting to lose my quote, I gutted through. Within an hour, I had the hang of it, and I’d gone from terrified to comfortable in a totally new world that’s been hiding in plain sight all along. As my fins touched the ocean’s sandy bottom, I knew my view of the world had changed completely, thanks to travel, yet again. It’s a feeling I can recall once before in perfect clarity, when I first set my hands on a granite rock on the other side of the world at Yosemite. Here, in a most unexpected place, I’d found it again: Discovery Channel come to life. That part is no coincidence. Santee was part of the crew that used to make films for Discovery. He’s traveled the world with the Cousteau’s, feeling the heat of submerged lava flows and the chill under arctic ice. 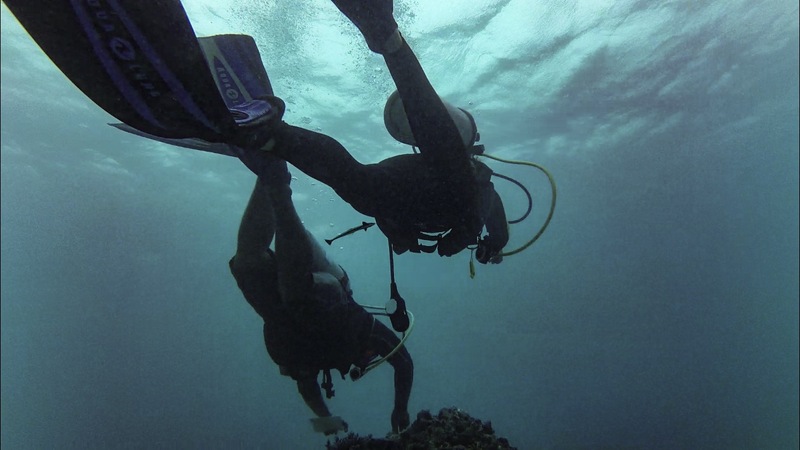 He’s dived on more reefs—from Fiji to Florida—than most people can dream of. He’s re-traced the sails of Magellan and Cook and Columbus. He’s flown the Explorer’s Club flag from his bow, though he can’t remember where. And he’s given me a gift: a fresh perspective that reveals just how connected we all are, from the smallest to the largest. There’s an amazing world out there, if you get out of your comfort zone.